The Goddess Matangi is a blend of the serene and the fierce from the Hindu pantheon of goddesses. She is the shyaam-rang (dark-complexioned) form of the Goddess Saraswati Herself, Who manifested herself as the daughter of the chandala, Rishi Matang. This was because of his intense aspiration to Brahminhood through the acquisition of knowledge (Saraswati is the goddess of learning). 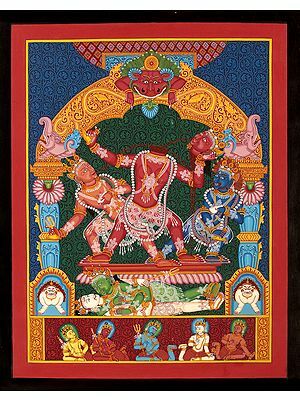 Mahavidya Matangi (of great learning) wields in her four hands the sickle indicative of her ferocity, a kapala symbolic of her association with cremation grounds (chandalas have traditionally been responsible for the rituals following death), and a slender veena that likens Her to Saraswati. In other words, Mahavidya Matangi is the Tantric form of Saraswati. 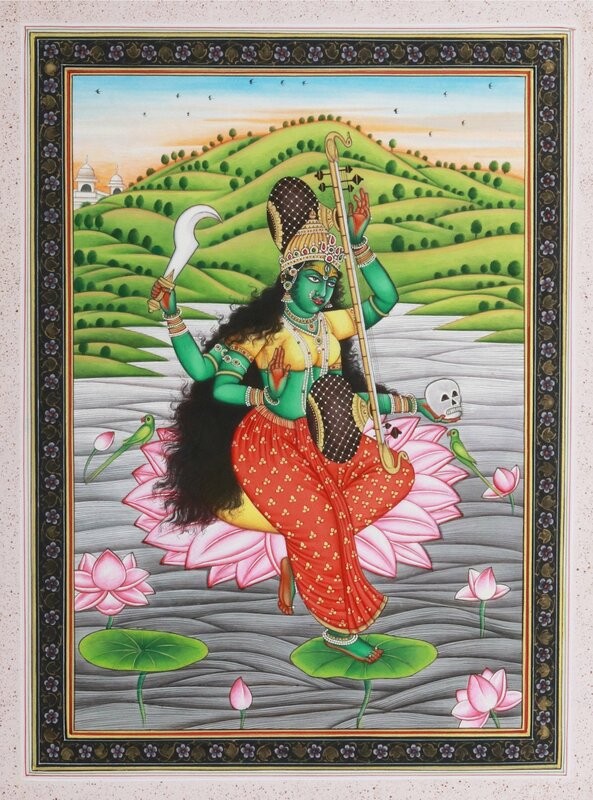 In this one-of-a-kind watercolour, She sits atop a delicate pink lotus in full bloom, Her tender foot rested on a lotuspad. Her figure is full and broad, adorned with ample golds and pearls and jewels. From beneath Her elaborate ruby- and emerald-studded gold crown emerges a sea of superbly curly, frizzy black tresses that seemingly have a life of their own. Note the glow of the third eye that suffuses the Devi's even temple. Undulating hills, their verdant coat set off by the grace of the twilight sun, constitute the background, together with a couple of temple-like structures to the left of the painting.